TRAVERSE CITY, Mich. (AP) — Isle Royale National Park's gray wolves, one of the world's most closely monitored predator populations, are at their lowest ebb in more than a half-century and could die out within a few years, scientists said Friday. Only nine wolves still wander the wilderness island chain in western Lake Superior and just one is known to be a female, raising doubts they'll bounce back from a recent free-fall unless people lend a hand, Michigan Tech University wildlife biologists Rolf Peterson and John Vucetich said in a report obtained by The Associated Press. 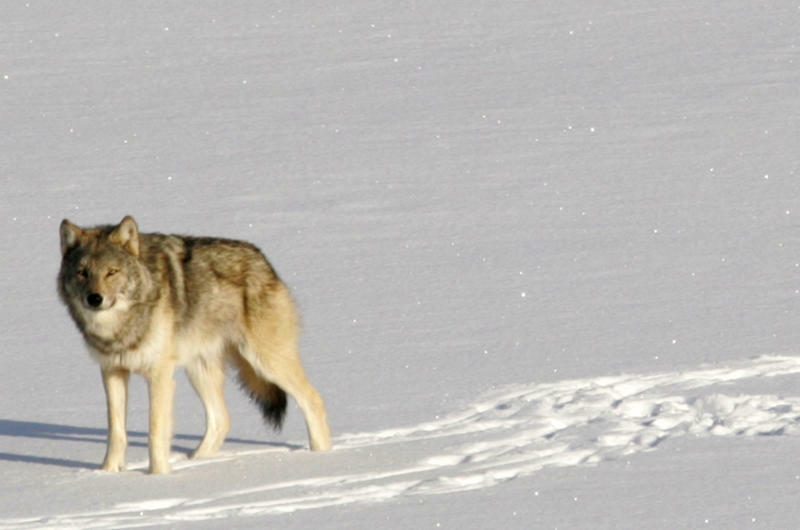 There were 24 wolves — roughly their long-term average number — as recently as 2009. "The wolves are at grave risk of extinction," Vucetich said in an interview. Their crash apparently results from a run of bad luck rather than a single catastrophe. A shortage of females has cut the birth rate, while breakdown of several packs boosted inbreeding and weakened the gene pool. Other troubles include disease and starvation from a drop-off of moose, the wolves' primary food source. Their population is the smallest since biologists began observing their interactions with moose in 1958, beginning what became the world's longest-running study of predators and prey in a single ecosystem, Vucetich said. Previously, the closest they came to extinction was during a parvovirus outbreak in the 1980s when their numbers plummeted from 50 to 12. Unless the wolves rebound quickly, the National Park Service will face the thorny question of whether to intervene. Officials could bring in reinforcements from the mainland to salvage the existing population. Or they could let nature take its course and, if the wolves die, start over with a new group. They also could leave it to the wolves to repopulate the island if they can. Agency experts have begun analyzing their options, Isle Royale Superintendent Phyllis Green said. "We don't want to make a decision based on a single species without evaluating the effects on other species that have been a part of the ecosystem through time," Green said. Scientists believe the island's first moose swam there from the Canadian mainland, 15 miles away, in the early 20th century and were so prolific that the island's balsam firs, aspens and other trees were severely overbrowsed. Wolves crossed an ice bridge to the island around 1950 and eventually formed packs that helped keep moose numbers in check. Although wolf sightings are rare, their presence is treasured by park visitors who hope to catch a glimpse on a backcountry trail or hear their eerie howls at night. "People like to know the wolves are there," said Peterson, who joined the study team in 1970. "It could be argued that this is the wolf's greatest refuge in the world. It's the only place they've never been killed by human beings." Because Isle Royale is a federal wilderness area, hunting and trapping are prohibited. Vucetich, Peterson and other scientists spend seven weeks on the island each winter, monitoring the wolves and moose by air. During their recently concluded visit, they discovered the wolf population had dropped from 16 last year to nine. The only intact pack had six members. One wolf wandered alone, while a couple — including the only known female — staked out territory and apparently mated. The wolves' best hope may be that the female will bear a healthy litter of pups next month and help form a new pack, Peterson said. Another positive sign: moose numbers rose from an estimated 515 last year to about 750. But a shortage remains of elderly moose that are easiest for wolves to kill. Prospects are increasingly remote that more wolves will find their way to Isle Royale without help, Vucetich said. A male is believed to have made the crossing on an ice bridge in the late 1990s and sired offspring, temporarily reinvigorating the gene pool. But a study published last week found that Great Lakes ice cover has declined 71 percent over the past 40 years. Vucetich and Peterson said they'd prefer to let the wolves determine their own fate — even if it means extinction. But if that happens, the park service should airlift more wolves to the island to prevent moose from running rampant and damaging the ecosystem, they said. Otherwise, "we'd be taking a vital wilderness and turning it into an overstocked barnyard," Peterson said. Restoring wolves also would enable continuation of the study, which has yielded a wealth of discoveries about both species, he said. In an essay scheduled for publication next month, Peterson and Vucetich acknowledge some scientists consider it unethical for humans to manipulate wildlife populations in wilderness areas. But they contend people have already changed Isle Royale's environment and the primary consideration should be protecting the ecosystem, for which wolves are essential as long as long as there are moose. David Mech, a wolf expert with the U.S. Geological Survey, advocated a hands-off policy unless the wolves die out. Even in their diminished state, they could last a decade or more and may pull a surprise comeback, he said. "This is a really unique opportunity to see what they can do," Mech said. "If there's any intervention, it destroys that potential." But if more wolves were brought in before the existing ones disappear, they could interbreed to the benefit of all, said Philip Hedrick, an Arizona State University conservation biologist. "Having the wolf eliminated for some period of time may result in secondary effects that would make it difficult to re-establish a population," he said.